#AceNewsReport – Mar.23: Furious Brexiteers caused motorway chaos across the UK as they organised a lorry go-slow at rush hour after the EU exit date was postponed: Traffic mayhem could be seen in Devon, Cornwall, Lancashire, Stoke-on-Trent, Hull and north Wales: Brexiteers of Brexit Direct Action are calling for similar ‘go slows’ across the country as they declare their fury at Theresa Mays negotiations: They claim that they have hauliers prepared across the land: The protests come as the exit date was postponed til at least April 12, as it was revealed today MPs could vote on cancelling Brexit altogether MailOnline reported. Three months of No Deal chaos are predicted in a secret Cabinet dossier, as Theresa May faces an embarrassing leak ahead of next week’s third meaningful vote: Operation Yellowhammer reportedly sets out Whitehall’s plans for how ministers will meet at 7am for a sitrep (situation report) to tackle crucial risk areas: Whitehall will outline briefings for the Brexit war room including details on national security, as well as food and water supplies: Civil servants could be expected to work alongside the executive branch for up to 12 weeks as they provide expertise throughout the night until 5.30am every day. The dossier seen by the Guardian outlines 12 hazards, including electricity and gas supplies, law and order, impacts to banking and national security both domestically and in overseas territories. What does yellowhammer mean and how did civil servants come up with the name? 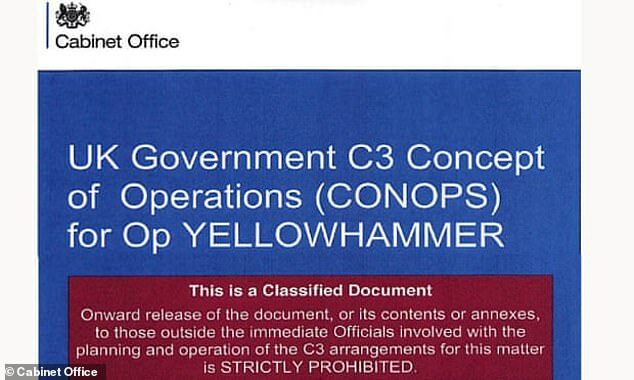 Yellowhammer is the code name for the work for planning a no deal Brexit carried out by the Civil Contingencies Secretariat (CCS). It takes its name from a small yellow bird which lives across the UK. They forage for seeds to eat, breed in May and enjoy singing. Male yellowhammers learn their songs from their fathers, and over the course of time regional dialects have developed. In ancient legend the birds were linked to the devil – the intricate patterns on their eggs were said to conceal an evil message. The Yellowhammer operation works across all Whitehall departments to ensure the UK is able to weather the shock of crashing out of the Brussels bloc. The word itself is randomly generated by a computer. The CCS was established in 2011 and works on projects to ensure the UK can handle potentially disruptive change. Projects similar to Yellowhammer have been carried out to prepare for the 2012 Olympics and the Champions League final. The news comes as the Ministry of Defence makes preparations for a nuclear-proof bunker beneath Whitehall to manage the military in the event of a no deal Brexit: Some 3,500 troops are being put on stand-by to deal with the apparent threat posed by crashing out of Europe. The Yellowhammer papers warn the command and control structure set out by the government could fail if ‘too many decisions are unnecessarily escalated to the top levels that could have reasonably been dealt with internally.’ It also concedes there are ‘likely to be unforeseen issues and impacts’ of a no deal Brexit that they have been unable to predict. The most important decisions in response to any potential crisis will be taken by the little-known European Union exit and trade (preparedness) subcommittee: The committee was set up in January, and is chaired by Theresa May, the Guardian reported.